We are the manufacturer of all kind of Cotton Fabrics. we have the own source for the fabric. so we are exporting the goods on time. Serving the industry for the last 27 years, we have been able to proficiently comprehend the exact requirements of our clients and offer fabrics that are in exact accordance with the same. 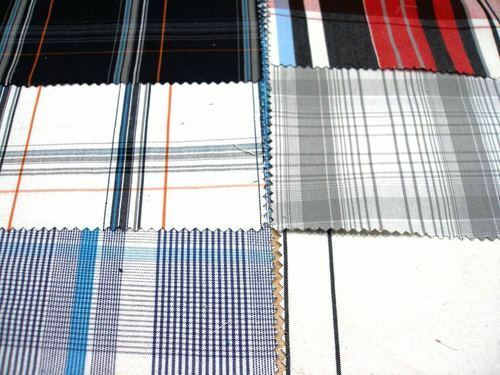 The gamut of Fabrics and Garments offered by us comprises Cotton Madras checks, Stripes, Dobby, Twill, Engineering Checks, Seer Sucker Checks, Poplin, Plains, Fancy Weaving in all counts, Oxford Chambery, 55% Linen – 45% Cotton fabric, 85% Cotton – 15% Linen fabric and 95% Cotton – 5% Lycra Checks and Plains. Our other specialties include Rayon/Linen, Cotton/Linen, 100% Linen, Pin tuck, Tie Dye and value added fabrics like hand painting, batiks etc.., hand and machine embroidered fabrics and Patchwork fabrics. Owing to their fine quality and superior finish of our fabrics, we have been able to establish a reputed list of clients spread all across the globe. We cater to the textile industry and have been able to offer fabrics of unsurpassed quality with the aid of our computer aided designing facilities, advanced machines and in house yarn testing equipments.